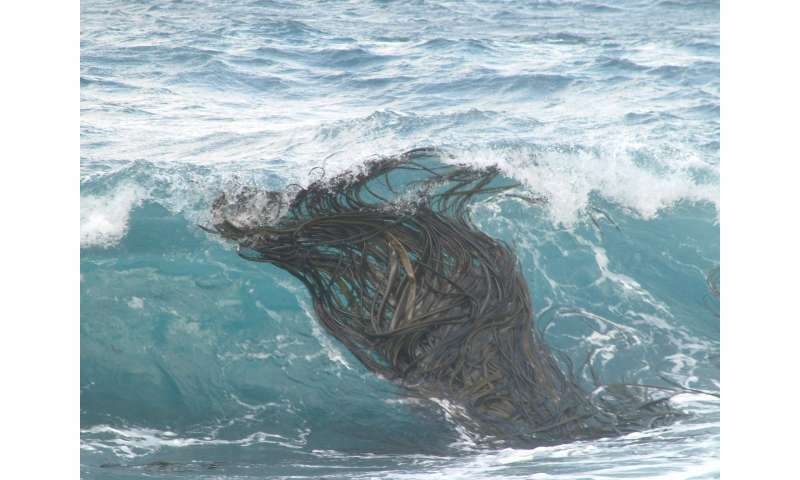 Kelp rafts can travel enormous distances over the ocean, bringing a range of life within the weed. Credit: Picture supplied by Dr. Ceridwen Fraser. 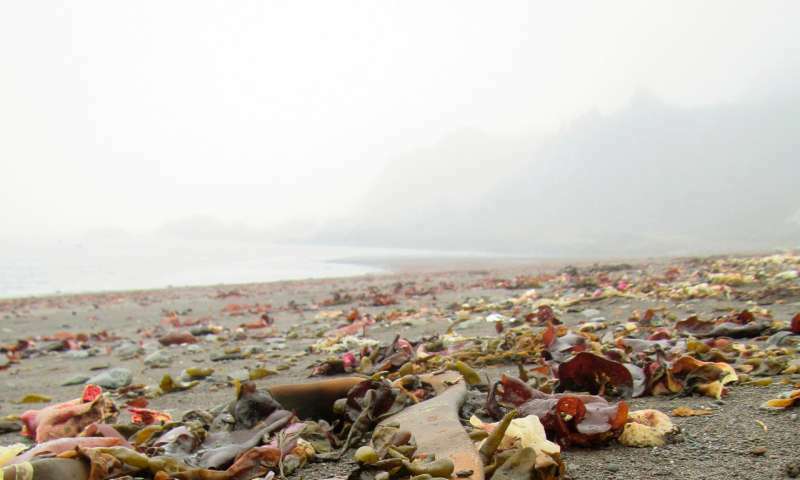 When Chilean researcher Dr. Erasmo Macaya from Universidad de Concepción and Centro IDEAL stumbled upon foreign kelp washed up on an Antarctic beach, he knew he had found something significant. New research reported today in Nature Climate Change by an international, multidisciplinary team of scientists reveals just how important that finding was. The team discovered the kelp had drifted 20,000km to reach that shore—making it the longest known biological rafting event ever recorded. To get there, the kelp had to pass through barriers created by polar winds and currents that were, until now, thought to be impenetrable. It means Antarctica is not as isolated from the rest of the world as scientists have thought, which has implications for how Antarctic ecosystems will change with global warming. "This finding shows us that living plants and animals can reach Antarctica across the ocean, with temperate and sub-Antarctic marine species probably bombarding Antarctic coastlines all the time," said lead author Dr. Crid Fraser from the Australian National University (ANU). "We always thought Antarctic plants and animals were distinct because they were isolated, but this research suggests these differences are almost entirely due to environmental extremes, not isolation." According to a fellow author from ANU and the ARC Centre of Excellence for Climate Extremes (CLEX), Dr. Adele Morrison, who led the oceanographic analyses, strong westerly winds and surface currents are expected to drive floating objects north and away from Antarctica. But when the disruptive influence of Antarctic storms is factored in, that all changes. 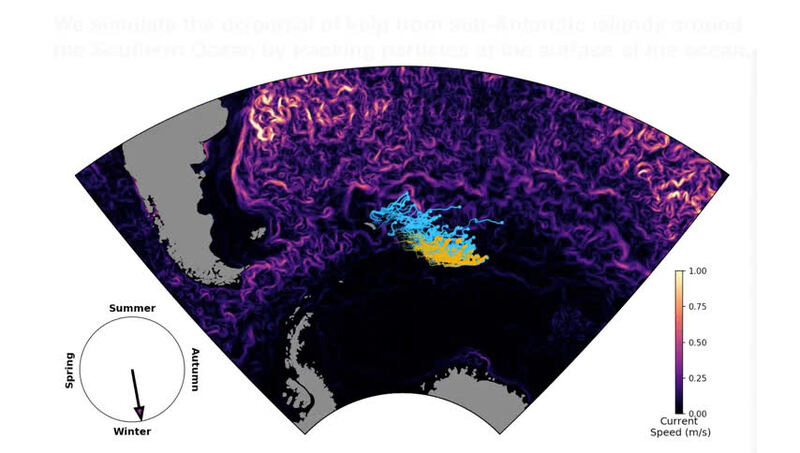 Using cutting-edge modelling techniques, the team began to see how large waves arising during storms could help kelp rafts to reach Antarctica. "Once we incorporated wave-driven surface motion, which is especially pronounced during storms, suddenly some of these biological rafts were able to fetch up on the Antarctic coastline," Dr. Morrison said. This has important implications for the science of ocean drift that is used to track plastics, aeroplane crash debris and other floating material across our seas. Further evidence that kelps regularly travel into Antarctic waters came from the Antarctic Circumnavigation Expedition (ACE), which observed kelps off the Antarctic Peninsula and East Antarctica. "These findings could change the way we model oceanic surface movement," said ANU and CLEX co-author Dr. Andy Hogg. "If this wave-driven surface motion—known as Stokes drift—influences the movement of particles around Antarctica, it could be important for other stormy seas too." DNA samples taken from the kelp revealed that one specimen drifted all the way from the Kerguelen Islands and another from South Georgia. This meant the routes they took to reach Antarctica must have been tens of thousands of kilometres long. "These are astonishing voyages, but worrying too," Dr. Fraser said. "They show that Antarctic ecosystems could be more vulnerable to global warming than we had suspected,"
"Parts of Antarctica are among the fastest warming places on Earth. If plants and animals get to Antarctica fairly frequently by floating across the ocean, they will be able to establish themselves as soon as the local environment becomes hospitable enough." It's something co-author Dr. Macaya, who discovered the kelp, recognises too. "I knew when I saw this floating seaweed—southern bull kelp—that it was important. The kelp does not grow in Antarctica but we know it can float, and can act as a raft, carrying many other intertidal plants and animals with it across oceans," he said. "If those rafts can make it this far, we could soon see massive changes in Antarctic intertidal ecosystems."